Drawing on a rich trove of historical sources—including recently released immigration records, oral histories, interviews, and letters—Lee brings alive the forgotten journeys, secrets, hardships, and triumphs of Chinese immigrants. Her timely book exposes the legacy of Chinese exclusion in current American immigration control and race relations. With the Chinese Exclusion Act of 1882, Chinese laborers became the first group in American history to be excluded from the United States on the basis of their race and class. This landmark law changed the course of U.S. immigration history, but we know little about its consequences for the Chinese in America or for the United States as a nation of immigrants. 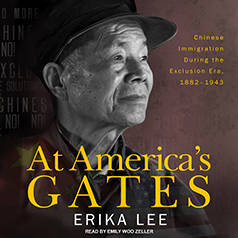 At America's Gates is the first book devoted entirely to both Chinese immigrants and the American immigration officials who sought to keep them out. Erika Lee explores how Chinese exclusion laws not only transformed Chinese American lives, immigration patterns, identities, and families but also recast the United States into a "gatekeeping nation." Immigrant identification, border enforcement, surveillance, and deportation policies were extended far beyond any controls that had existed in the United States before.